It's a sequel to Danganronpa: The Animation (2013) and a spin-off of the computer game franchise. It's also kind of amazing. It's not perfect, but it's shocking and it hit me pretty hard. Firstly, I'm going to be censoring this review. Everything and everyone here is a walking spoiler for the 2013 series, since in this franchise just surviving to the final episode feels like a miracle. To get around this, I'll give all the characters false names. Secondly, we need terminology. 1. GAMES - lots of them, from 2010 onwards. Story-heavy and so dark that fans bashed Danganronpa 3 for not having a sufficiently bleak ending. 2. DTA, i.e. Danganronpa: The Animation - the 2013 anime series, in which schoolchildren play a murder game at the behest of a teddy bear called Monokuma. Wild colours and designs, extreme carnage, hugely entertaining. However it's about hope vs. despair, with the ending raising the stakes to SPOILER level. 5. Despair Arc (TEoHPHS episodes 2, 4, 6, 8, 10, 12, 14, 16, 18, 20 and 22) - the prequel episodes, originally broadcast on Thursdays. The world hasn't yet ended (for the first time). Civilisation's okay. The sun is shining, schoolchildren are happy and everyone's happy at Hope's Peak High School. Hint: SPOILER's going to do something about that. Don't expect a happy ending. 6. Hope Arc (TEoHPHS episode 24: "The School of Hope and the Students of Despair") - the end. 7. 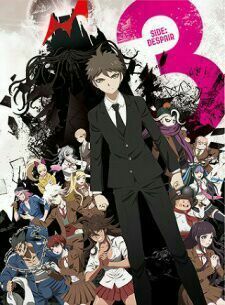 OVA ("Super Danganronpa 2.5: Nagito Komaeda and the Destroyer of Worlds") - bonus episode, broadcast in January the following year. It's also quite good. Unusually for an OVA, it avoids pointlessness by finding an important niche in the gaps between the Despair and Future arcs. Watch it if you can, although you needn't worry if you can't since the televised episodes are complete and satisfying in themselves. It's bleak. It's horrifying. It has one of the most apocalyptic villains I can remember offhand in anything, being a chirpy lovable idealist (and absolute monster) who believes that hope is predictable and that despair offers exciting chaos and infinite potential. (I'll call him/her VILLAIN.) VILLAIN is pure evil, but in a way that's riveting because their anti-morality and law/chaos dichotomy is so well developed. VILLAIN will destroy the world, as we already knew before ep.1. This is a quality most villains aren't allowed, since other stories tend to be more traditional about little details like that. I was riveted, although in hindsight I also don't think that that arc was quite working before VILLAIN showed up. There's set-up and character establishment that I don't think quite achieved what was required for the emotional payoffs in the second half and in Hope Arc. Theoretically it's there. It worked. Hope Arc hit me hard. However I think another two or three episodes and more carefully built storytelling would have made it even more powerful, establishing the characters more clearly in our minds and making its events more meaningful. Horrible things happen. Of course the whole franchise is fantastical, but even I was shocked by what might either be torture or an amateur lobotomy... and there's room for disagreement about whether that's even the most horrifying thing being experienced just then by the victim. Surprising things happen. This show can make you swear at the screen just by rolling its end credits. Despair Arc is also more mundane visually than DTA, incidentally, while Future Arc is bleak, grey and almost colourless. I loved it. However I'd loved DTA, so I was already primed. Watching this without having first watched DTA would be a terrible idea, partly because you'd be lost and partly because much of its power comes from the fact that it's heading for the The Biggest, Most Awful, Most Despair-Inducing Event in Human History. We know this before it starts. We've seen it. VILLAIN's going to destroy us all. I've seen some viewers criticise this series for being so dark and doomed that it's impossible to care, while others complain about the positive ending. Personally I think those justify each other. The horror means that the ending is earned, while conversely the ending makes it possible to watch this show without slitting your wrists afterwards. As I said, it's not perfect. We don't get to know the (large) cast nearly as well as in DTA and they're not all well used, which can make some of them seem expendable and one-note. It can be hard even to remember everyone's one-line character description and/or special talent. There are pacing problems. The ending is controversial. Personally, though, I'm happy to live with all that. I'm impressed by the show's tone, by how boldly it's struck out in new directions and by the ambition of what it's achieved with two interleaving storylines. Some characters are written powerfully, with memorable bonds between them. The Future Arc's killing game is innovative. VILLAIN is staggering. Also, importantly, it's just as interested in hope as in despair, with the show not being a soul-crushing downer at all for me. I found the end of TEoHPHS emotional. I loved it.